“Mary Chase, did you have a good day at school? No, Mommy, not a good day, a GREAT day!” What mother or daddy does not love to hear these words from their child after his or her first day of school? 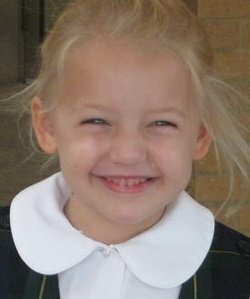 This past week my oldest granddaughter began kindergarten and it caused me to reflect on my first years of school. Beginning a new school experience is an exciting time in the life of a child and his/her family. I remember the fun of picking out new school clothes, anxious to wear new skirts and sweaters even on those hot humid September days in Mississippi. My brother and I took forever in the local Woolworth trying to pick out the latest notebooks with just the right colors and designs. It’s funny now that I think about it; we didn’t have back packs or school bags. We simply carried our books. Most people ate in the school cafeteria, so we didn’t have lunch boxes either. When those hot September days started giving way into cool crisp October ones, we knew school had begun in earnest. Try as I might I can’t really remember much in the way of academics though I did learn “reading and writing and rithmetic” at some point. What I most remember are things like being a Yellow Jacket cheerleader for the Pee Wee football squad and getting to wear a gold corduroy skirt lined in black satin, and a gold scarf wrapped around the collar of my white blouse. Never mind that the cheerleaders were bigger than the football players. Thirty little girls running up and down the sidelines screaming at the top of their lungs must have frightened the most formidable opponent. Along with football was the yearly Halloween carnival with all kinds of food and activities. The cake walk and the go fishing booth were definitely favorites. What child didn’t love winning a real live pet! A gold-fish in a plastic bag filled with water! I am afraid the PETA folks would have had a coronary at the way those poor gold-fish found “freedom” outside those plastic bags during the course of the night. The most popular activity hands down, however, was the Spook House. Mobs of children crowded the door. The unsuspecting person was blind folded and then led along the different stations to experience all kinds of frightful things. The screams heard from within only enhanced the mood of those waiting in line. No amount of reasoning can convince me to this day that those “eyeballs” were not the real thing, though I do admit to seeing the fifth graders popping them in their mouths when the lights came on. The highlight of the evening for the parents had to be the annual talent show. It meant they could sit down in the dark for a good hour and a half. But they paid dearly for this privilege. Any child could participate in the show, and therein lay the problem. Convinced that my cheerleader outfit would make up for any short comings in my talent, I decided to sing a song. And what song would be appropriate in such a get up but “You gotta be a football hero to get along with the beautiful girls,” all done to accompanying hand motions. I received such accolades for my performance that I was quite shocked when my mother and daddy refused to enter me in the Little Miss Maid of Cotton contest in Memphis. My talent would have clinched it!! But if not my song, my gold corduroy skirt for sure! My Granddaughter is right. School is not just good. It is GREAT!! So cute! Pam, I can see you in your little cheerleader uniform screaming at the top of your lungs. I love all of your descriptive writing. It took me down memory lane. Oh, there are many more fashions in my historical (not hysterical!) closet!! I should mention, however, that while MC is still very excited about school, I’m not sure she realized she would be going every day! Uh oh! We might need an update about some of the “difficult” moments in school. I think Miriam got her writing ability from you. I love your blogs and Miriam’s replies. Hang in there Mary Chase. 12 years are not so long. I am so glad you like the blogs. This is all brand new for us. I had so forgotten about little leaque cheerleading, and yes, one of the highlights of elementary school. I was a Panther with blue and orange uniform. Thanks so much for your comment. Somehow the Panthers sound a lot more ferocious than the Yellow Jackets. Such fun memories!